A few quick observations on the Buccaneers stunning season-opening 48-40 victory over the Saints while fantasy football fans everywhere scramble to add Ryan Fitzpatrick to their roster. A lot is going to be made of the Bucs decision to change offensive play callers in the wake of this massive upset, but the Bucs won on Sunday because they EXECUTED the plays that were called to near perfection. That’s not to take anything away from the play calls that coordinator Todd Monken made in place of head coach Dirk Koetter. But we simply have no way of knowing what plays Koetter would have called. For that reason, there is no way to know if he would have called a significant number of plays differently than Monken. After all, it’s not like they would have been working off different play sheets. There’s one game plan per game, it’s all produced by a committee of coaches and the small handful of plays that go on the play sheet are the plays that are called and often in conjunction with the quarterback’s wishes. 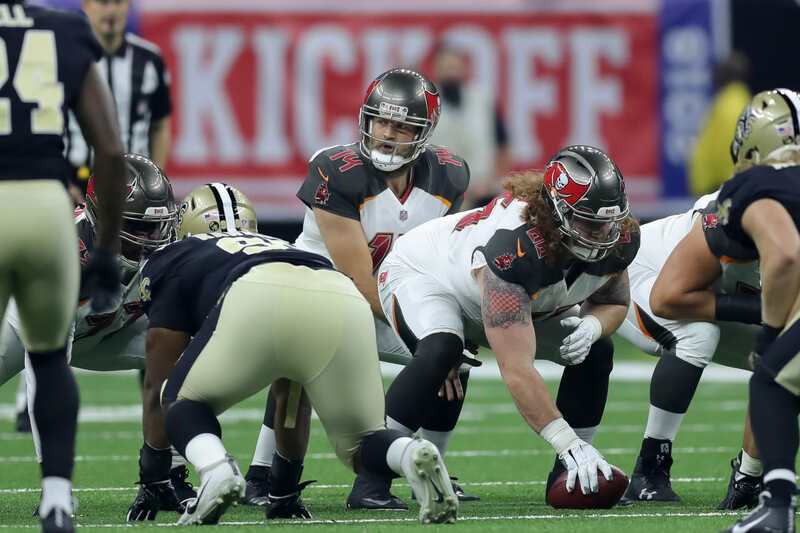 Whether the plays work or not usually comes down to execution, and on Sunday, the Bucs did an exquisite job of executing almost every play, whether it was in the pass game or the run game. Fitzpatrick, for example, was about as close to perfect as a quarterback can be in helping the Bucs build a 31-24 first-half lead, completing 11 of 14 passes for 210 yards, two touchdowns, no picks and a 158.3 passer rating. Fitzpatrick wasn’t quite as sharp in the second half, but he was on the mark when he had to be, hitting Mike Evans for 50 yards for one score and DeSean Jackson (again) for 58 more and another. And let’s not forget what Peyton Barber did to help set up all those deep throws. Barber ran 19 times for 69 yards, and was strong almost from the outset, running 23 yards on a first-down to ignite the Bucs first scoring drive. Something else to keep in mind is that the Bucs offensive line was superb. Fitzpatrick was hit a few times but for the most part the line gave him plenty of time to go through his progressions and find open receivers. That’s a point that cannot be understated. Though he did a great job of making decisions, including when he was under pressure and had to run, Fitzpatrick under pressure is not a good option for the Bucs. And while we’re on the subject of pressure, the Bucs defensive front didn’t provide a lot of it. They recorded just one sack and three QB hits, allowing Saints quarterback Drew Brees to pass for 439 yards. But the line did apply enough pressure at key moments Sunday to force Brees into a few throwaways that proved critical when the game was still a tossup late in the first half and early in the second. And kudos to the Bucs secondary. They spent most of the day playing off coverage, which is tough against a surgeon such as Brees, but they largely kept the ball in front of them and didn’t allow a lot of yards after the catch. Even better was the fact the Bucs twice took the ball away. Few things matter more in a game of football than the takeaway margin and the Bucs won there as well Sunday, forcing and taking away two fumbles, including one for a touchdown, while never giving it away.